We bring forth for our esteemed clients a comprehensive range of Karl Fischer Moisture Measurement Equipment. Manufactured using high-end technology, this range of products is excellence at par in terms of performance, accuracy, easy operation and high durability. 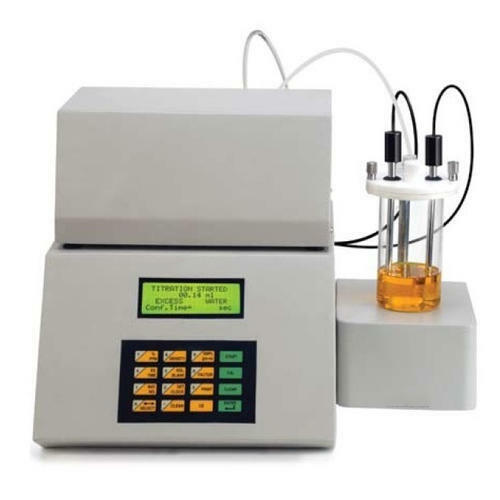 Widely known for its features like volumetric titration, fully automatic, superior range, ability to measure the amount of water in various parameters such as percentage, ppm & mg and a large interface, this range has generated a huge demand in the market. Leveraging on years of experience founded in 2012 , Minimac Systems Pvt Ltd , Pune is an ISO 9001:2008 certified prominent company engaged in supplying, distributing, manufacturing, exporting and trading a range of Oil Purification & Reconditioning Plants, Laser Particle Counters and Allied Machines. The range comprises Turbine Oil Cleaning Systems, Hydraulic Oil Cleaning Systems, Transformer Oil Cleaning Systems, Turbine EHC Filtration Systems, Engine Oil Purifier Systems and Oil Cleaning Systems. In addition to this we offer Oil Flushing Systems, Online - Inline Particle Counters, ISO And NAS Patch Testing Kit, Visgage Oil Test Kits, General Hydrogauges, Stainless Steel Tool Box and many more. These products are widely acclaimed for their features such as optimum performance, high efficiency and robust construction. The entire range is highly demanded in various industries such as food, chemical and pharmaceutical industries. In addition to this we render Industrial Services & undertake Annual Maintenance Contract. Spread over a vast stretch of land, Minimac Systems Pvt Ltd has infrastructure equipped with modern technology and advanced machines. This infrastructure is segregated into various units so as to carry out various business processes in a safe and efficient manner. Our adept and dexterous professionals assure to meet the exact requirements of our clients and thus work with utmost perfection. Owing to our ethical business policies and standards, we have been able to serve numerous patrons across the Australia/NZ, Indian Subcontinent, East/Middle Africa to name a few.